The Mid July 2014 Issue of Practical Welding Letter, Bulletin 98, introducing Resources on Design for Welding was not distributed by e-mail but is available at Bulletin 98 and from the Welding Resources Page. Here we are again with Issue 132 of Practical Welding Letter for August 2014, with information deemed to be important and/or interesting for those who deal with Welding Technology. The first article reminds the importance of one unique department, present in any industry, on which the good performance of the whole company depends. Therefore its build up and the quality of its members requires special attention, and a good deal of support from Management. Then we report on a published article on Vacuum Aluminum Brazing, where some important process parameters are highlighted as deserving understanding and care for obtaining successful production results. In the subsequent article a novel and different approach is proposed for reducing welding distortion, a nagging disturbance omnipresent in most fabrication environments. Satisfactory pulse welding control is by now regularly achieved in modern equipment. How it is performed and checked in real time is the subject of an article reported here, that could possibly be used as standard of reference for monitoring practical industrial applications. In the Site Update section a new page introduces Distance Learning, a revolutionary method likely to free most students from the constraints of their busy lives, to the point of allowing them reach the advanced education they could only dream of before. The new Mid Month Bulletin provides online resources on Design for Welding, a heavy subject on which mainly depends the quality of many constructions. Providing safety in the work place is required by law. A reminder may be useful for a periodic check of the provisions in place, before an official audit is performed and before an accident happens. The other regular sections are at their usual place. For those who may be looking for answers on certain subjects, the search window on most website pages may be a good place to start from. The Site Map may also help as well as the Index Welding Page. Use the Contact Us form for your queries, comments and feedback. The maintenance department of every industry is an essential function trusted with the heavy responsibility of assuring the continuing and smooth operation of all the plant facilities. Its success in performing the job adequately depends mostly on the knowledge and experience of its members but also on the backing given by a responsive management to its needs and requests. Given the central importance of the proper actions to be taken by the department, usually under conditions of hurry and pressing constraints, it is not surprising that the American Welding Society (AWS) Welding Handbook, Ninth Edition, Volume 4, dedicates a whole chapter, no. 9, Materials and Applications, Part 1, from page 565, to the subject of this article. AWS Member price: $15 per chapter. When a sudden stop of production occurs, the pressing requirement is to get the equipment back into service with minimum downtime. Hurry may suggest to take improper steps, likely sometimes to make the situation even worse. An assessment of the situation has to be done, by a committee including all knowledgeable people having relevant experience, to verify the real extent of the damage, and to assemble all available data on the elements involved, together with information on past history of the same of or similar failures. To test the feasibility of possible solutions, a check list is offered in the above chapter, useful to exclude the omission of important factors that should be always considered. Assuming that the welding repair decision is adopted, even if for a temporary solution, a detailed operation plan should be prepared, preferably using a decision model diagram showing a logic path including action steps and decision road forks with feedback loops highlighting the interdependence of different aspects of the process. A suitable plan may involve the procurement of special filler metals or even the procurement of special services to be outsourced to specialized providers. Tests may need to be made on scrap metal, and special training of welders may be needed for qualification. Determining the causes of the original failure is important to help avoiding future recurrences. One should never attempt to weld anything without knowing beforehand the type of material, its hardness and if any surface treatment is present to modify its properties. Useful nondestructive methods are available. Then one should know if applying welding heat could affect dangerously the mechanical properties of the item to be repaired. Alternative processes might be possible if welding is considered harmful in the specific case, especially if the repair is temporary until new parts are procured or made. Post weld testing is essential to prove the repair quality. Additional special treatments may be necessary. Preventive maintenance, based on thorough analysis and detailed planning may go a long way in avoiding costly breakdown. But to be effective it must be applied with the perseverance used in the airline transport industry. For further reading see Repair Welding and Material Identification. See also the page on Service Failures and our article on Weld Repair. GE Steam Turbine Shop Repairs. Readers may recall that some time ago, in issue 129 of this publication (see PWL#129) an article was published (3) on Vacuum Furnace Brazing. Now, following the lead of an article published in the July 2014 issue of AM&P, an ASM International publication, at page 15, we point out a few key issues of Vacuum Aluminum Brazing. In the previous article titanium was indicated as the preferred getter material to remove oxygen traces from the vacuum furnace atmosphere intended for brazing stainless steels and nickel alloys. Here, dealing with Vacuum Aluminum Brazing (VAB), the special role of Magnesium as a getter is highlighted, as Mg is used as an additive to the filler metal and/or base metal of the parts to be brazed. Upon reaching the above temperature in the furnace brazing cycle, the sudden magnesium vaporization produces significant outgassing, challenging the pumping capacity of the system that "must be adequately sized to maintain a good working vacuum (10-4 to 10-5 torr range)". It is stressed that precise temperature control and uniformity are important process parameters, because of the limited process temperature window that, if exceeded, may cause heat damage to the parts. Correct temperature programming for the aluminum brazing process calls for a short soaking time just below the solidus of base metal to equalize temperatures, so that all joints reach the brazing temperature at the same time. Then a short ramp to the brazing temperature causes the filler metal to melt and flow, wetting the joint surfaces and joining the parts. The time at brazing temperature must be kept to a minimum, followed by cooling under vacuum. Key parameters for successful brazing are cleanliness, proper joint design, correct joint clearance, proper fixturing. Equipment must provide the deep vacuum required and suitable temperature control and uniformity. Routine furnace maintenance programs must be implemented to allow continuing quality in brazing production. Interested readers are urged to seek the original article quoted above. An Article published in the Research Supplement of the July 2014 issue of the Welding Journal at page 243-s offers an interesting overview of studies aimed at developing special filler metals for joining mild steel. It is known that distortion is caused by residual stresses developed in the weldments by local heating, which induces expansion with reduced yield strength. The thermal expansion is hindered by cool surroundings, so that the weld metal becomes upset or plastically deformed: therefore, upon cooling down, it shrinks to a shorter dimension, thereby developing residual tensile stresses. For a more complete description of the reasons for warping, readers are addressed to our page on Welding Distortion. While thermal and mechanical methods are known and used to reduce the level of residual stresses, especially harmful for structures subjected to fatigue, they all include economic costs that should be preferably avoided. The above article reports on research intended to develop new filler consumables capable to promote martensitic structures upon cooling, especially near the weld toe regions. As the martensitic transformation is accompanied by volumetric growth, this expansion would create compressive stresses effectively opposing the formation of residual tensile stresses. These experimental compositions are collectively described as Low­Transformation­Temperature (LTT) Welding Consumables for Residual Stress Management which describes also the article title. Specific compositions were sought from the Schaeffler's diagram describing the different microstructures of stainless steels as function of the equivalents of Chromium and Nickel. The aim was to identify possible compositions where the start of the martensitic transformation would occur at 200 or alternatively at 350 °C. Four such experimental compositions of low martensitic transformation temperatures were designed and tested by procuring the quantities of wire needed. The research was most thoroughly conducted, using all classical mechanical properties tests. In the welds deposited with the experimental welding wires, the microstructure achieved within the fusion zone was found martensitic as required. It was also demonstrated that the welded joints using the experimental LTT welding consumables showed smaller transversal, out-of-plane distortions with respect to a conventional wire, not intended to produce martensititc transformation. It seems safe to conclude that additional research along these same lines will be able to identify several compositions capable to provide the required level of distortion control. Note: Be patient: the download may take a few minutes. Continuous sequence is a longitudinal sequence in which each weld bead is made continuously from one end of the joint to another. Downhill welding is performed with a downward progression. Electron beam gun column includes, besides the gun, also auxiliary mechanical and electrical components that may include beam alignment, focus and deflection coils (magnetic lens). Friction speed in friction welding is the relative velocity of the workpieces at initial contact. Material Safety Data Sheet is intended to provide workers and emergency personnel with procedures for handling or working with that hazardous substance in a safe manner, in conformance with official dispositions relative to occupational safety and health. Oxyfuel gas cutting torch is a device used for directing the preheating flame produced by the controlled combustion of fuel gases and to direct and control the cutting oxygen flow. Plasma arc cutting torch is a device used to transfer current to a fixed nonconsumable cutting electrode, position it, and direct the flow of shielding gas and of orifice (cutting) gas. There was a time, years ago, when pulsed Gas Metal Arc Welding was looked at, by welding technologists, with awe and suspicion as unreliable, producing unsteady results and subject to maintenance problems. Since then continuing progress in better understanding of electronic design and success in micro chip design and production, achieved remarkable improvement such that current available equipment from renowned suppliers can be regarded at with trust, to be capable of perfect performance for long production runs without problems. An Article published in the July 2014 issue of the Welding Journal at page 36 and titled The Control System for a DC Pulse Welding Machine describes a machine probably built at a research facility. What seems exceptional is that the self control achieved in real time permits the stable droplet transfer mode of "one pulse-one drop". These results have been confirmed time and again both by recording the welding current waveform electronic traces and the actual metal drop transfer as seen by high speed photography. This is the ultimate evidence that the process GMAW-P can be brought under control and used with confidence for demanding applications. Readers employing this process may look at the original article mentioned above, for seeing how the positive effects are achieved and for requesting from their suppliers equivalent proofs relative to the quality of their equipment. The Pages of this Month bring some new information. They might be considered by those willing to improve their welding knowledge. The opportunity to learn welding disciplines at one's own pace is now offered by most qualified academic institutions. The freedom to select the courses, their duration and the best time for learning, independent from student's location, can remove usually rigid constraints that may limit accessibility. Availability and links can be found in our new page on Distance Learning. Good and effective welding can only start from design that takes into account all the interdependent factors that influence the results, including materials, processes, treatments and finish. There are many non self evident details that could bring unexpected problematic result. As recommended by AWS, welding design should be at least reviewed by experts, to prevent costly repairs. 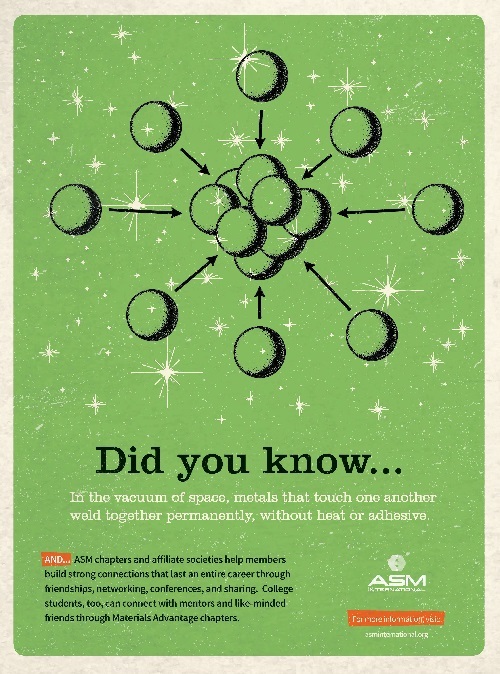 Resources on Design for Welding are listed in the new Bulletin 98. 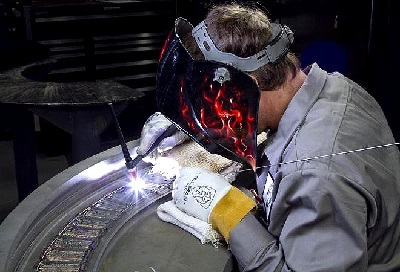 Readers are invited to explore the many facets of welding exposed in this website. The Site Map may be a good place to start from to unveil critical information. You may always Contact Us whenever you feel that we could offer some help. ...how to decrease fuel consumption by 5%? ...how to diy with Copper? and Excited about Engineering Careers? ...where metals that touch one another weld together permanently? 9.1 - Hot Upset Forging is a bulk forming process for enlarging and reshaping some of the cross sectional areas of a bar, tube, or other product form of uniform (usually round) section. It is accomplished by holding the heated forging stock between grooved dies or otherwise by having it standing on a press plate and applying pressure to the end of the stock, in the direction of its axis, by the use of a heading tool, which spreads (upsets) the end by metal displacement. 9.2 - Infiltration is the process of filling the pores of a sintered or unsintered compact with a metal or alloy of lower melting temperature, with the purpose of making it impervious. 9.3 - Levitation melting is an induction melting process in which the metal being melted is suspended by an electromagnetic field and is not in contact with a container. 9.4 - Mechanical Hysteresis represents the energy absorbed in a complete cycle of loading and unloading within the elastic limit, and represented by the closed loop of the stress-strain curves for loading and unloading. Sometimes referred to as elastic. 9.5 - Notch Acuity relates to the severity of the stress concentration produced by a given notch in a particular structure. If the depth of the notch is very small compared with the width (or diameter) of the narrowest cross section, acuity may be expressed as the ratio of the notch depth to the notch root radius. Otherwise, acuity is defined as the ratio of one-half the width (or diameter) of the narrowest cross section to the notch root radius. 9.6 - Ore is called a natural mineral that may be mined and treated for the extraction of any of its components, metallic or otherwise, at a profit. Chapter 17 on SAFE PRACTICES from the AWS Welding Handbook Ninth Edition Volume 1, provides an overview of the most important subjects and of the binding laws and regulations connected with welding precautions. Crowds of workers employed in the manifold activities stemming from the main welding technologies are exposed to many dangers. The only way to minimize accidents and casualties is to make sure that all relevant provisions are properly taken care of. The ultimate responsibility rests squarely on Management's shoulders. As stated in the Chapter quoted above, "Management must clearly state safety guidelines and require that everyone - including management - follow safe practices consistently". In particular employers must inform personnel of potential hazards in the workplace, and provide training on the safe handling of hazardous materials. Thorough and effective training in the safe operation and maintenance of all equipment is an essential aspect of any safety program. It is stressed that "good housekeeping is essential in ensuring safe and healthy working conditions". Personnel must be safeguarded from being injured by equipment. Proper locking and warning must be attached to equipment temporarily disconnected for maintenance to avoid inadvertent activation. Personal protective equipment must be supplied and training on its proper use must be part of a safety program establishing general procedures. Respiratory protection has to be implemented, as well as control of fumes and gases. Electrical safety must be addressed by having a competent professional fully instruct employees, enabling them to perform routine maintenance and find out dangerous equipment conditions requiring immediate repair. It is important that those in charge be fully informed of the potential dangers and of the preventive measures that the law requires to be in place in any working area where welding is performed. Besides procuring and keeping handy for reference the Chapter 17 mentioned above, the following sources can be explored for getting additional information. Details: Hello again - 131 good issues in a row. that made the article more readable and interesting. I would expect from correspondents to ask how to find the information they need in the published pages of my website when confronting an unexpected problem. This is easily accomplished by using the FOUR hints listed in our Contact-us Form. But it would seem that most inquirers don't bother to follow the suggestion. What they do instead, is giving a summary account of the negative outcome and ask for the complete solution. They don't realize that without a full understanding of the base conditions it is almost impossible to come up with useful answers. Moreover quite often it appears that those who ask are not really interested in the answer and anyhow they seem not to care about the consequences of the hindrances, whatever the real cost to them. Therefore a practical suggestion could be: try to figure out the real costs of your problems. That would put the accident in its real perspective and spur one to find economic solutions. Structural Materials Technology (SMT) 2014. Aug. 25–27. Grand Hyatt Washington, Washington, D.C.
October 8-9, 2014 - AWS Headquarters, Miami Fl.